Stone and ceramic tile manufacturers as well as companies creating mosaics, borders, medallions, accents, corners, and listellos use our Back-Mount papers to preassemble tiles into patterns. We manufacture and stock 11-1/2″ x 11-1/2″ and can make 11-1/2″ x 1/2″ strips up to 11-1/2″ x 99″ long. Paper is 0.0115″ thick, extra strength, white mounting stock. Surface is ideal for gluing, compatible with all appropriate adhesives. Holes are 3/8″ square, staggered. We manufacture 1,000′ rolls in a width of 11-1/2″. The paper we use in our rolls is the same white paper as used for sheets above. This is a bi-directionally strong paper with good wet strength properties and excellent gluing surface. Holes are 3/8″ square, staggered. Small shop mosaic artisans, large ceramic tile manufacturers, and everyone between use Mesh-Mount Paper to make mosaics, borders, medallions, accents, listellos, corners, and more. Application is manual, semiautomated, or fully automated; our rolls are designed for use in meshing machines, but are ideally suited for manual assembly as well. 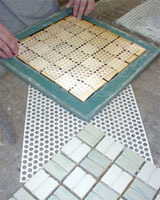 For gluing the tiles to the paper, most manufacturers use white PVA glues such as Elmers or thinned wood glue. For best adhesion, apply the adhesive to the paper only. Where water resistance is a major consideration, water resistant adhesives can be used, or try our front-mount Tile Tape. Mesh-Mount paper has a 55% open area, so more than half of the rear surface of your tile makes contact with the mortar/thinset. Hundreds of stone and tile companies have had great success for over 30 years using Mesh-Mount paper.